It's not clear what criteria Tygem uses to choose players who play under their real names in the tournament. Last year it was YHPak (Park Young Hun, 9p, Korea), HanSHoon (Han Sanghoon, 7p, Korea) and jiangwj (Jiang Weijie, 9P,China). Best result showed YHPak 9p reaching the semifinals and losing to gjopok 9d. I believe it's always hard to play under your real name since the opponent knows your style of playing and can prepare for the game beforehand. This year a Chinese prodigy Dang Yifei 4p was chosen to play under his real name. He is only 17 years old but already reached the finals of the 4th BC Card Cup, defeating on his way top players including Lee Sedol 9p. In finals Dang lost to Baek Hongsuk 9p, in an even match 1-3. He still needs to gain experience to win such serious games as finals of the international tournaments. I bet we'll see him very soon; his whole life is before him. Dang Yifei 4p and his opponent kkttddww 9d were both seeded for the last round of 32. I didn't find much information about Korean player kkttddww 9d. He's definitely one of the top pro players, he plays a lot on Tygem and only against top Tygem players. 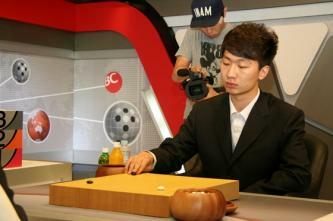 Yesterday, for instance he defeated daxiang 9d (Wang Haoyang, 6p, China) 3 times in a row. The opening was rather peaceful, both players prepared for a long war. Such games are usually decided in yose and in the end Dang lost the game by 2.5 points. (All 3 Chinese players were qualified from the preliminaries). According to Tygem: "The actual names of finalists will be revealed". So if Lurk(P) reaches the finals we may learn his real name. The picture that Lurk used as avatar is from a Chinese TV show named "Lurk" ^^"! Too bad he didn't put his real picture, it would have been great to know who he really is :)!